If you missed my article on What Stress Does to Your Body, check it out. Chronic stress does horrible things to you internally and can eventually lead to deadly complications. 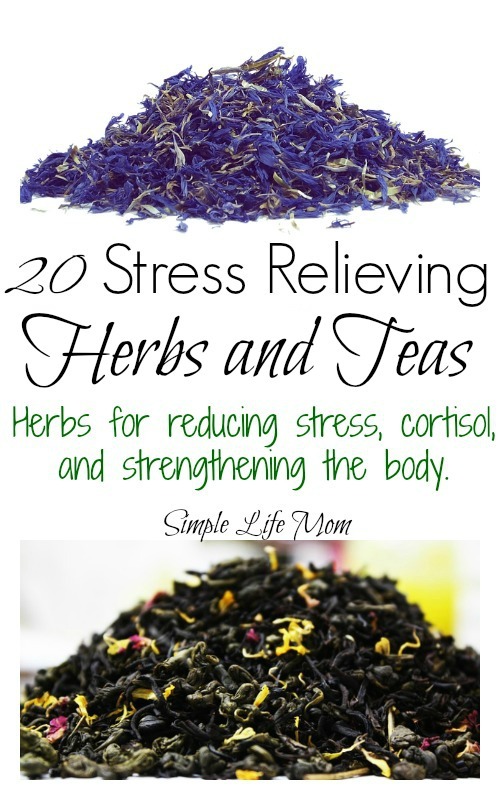 Having a resource of Stress Relieving Herbs and Teas can be extremely beneficial. There is good stress and bad stress. You can be stressed over little things like trying to sort out the cheapest energy provider (which is something you can do through someone like Simply Switch). Stress that motivates us and encourages us to work hard toward a goal is considered a positive stress. But there is also such thing as negative stress. This is stress that affects your life in a bad way and makes you want to do less work, not more. This type of stress often happens in a bad workplace that doesn’t take into account their employee’s mental health. Some people find that using CBD based products can help relieve their stress. If you are interested in finding out more about CBD products you might want to read the top online reviews for CBD oils as they might be able to give you the information you are looking for. However, if you have found yourself developing disorders like anxiety after experiencing too much stress at work then you may want to contact a workers compensation attorney. Negative stress is also caused by things outside of work and while what is commonly referred to as stress are events or lifestyles that can leave a person feeling: I can’t get all of this done, I have too much going on, I am sick so what’s going to happen to me, too many people are relying on me, no one likes me or loves me, and on and on. Everyone responds to events differently, depending on their attitudes, religion, and experiences. 4 things I mention in What Stress Does to Your Body is to: Get Organized, Prioritize, Say No, and Exercise (Read More for Why). So, what if you are exercising, cutting back, prioritizing, and getting organized, and yet still feel like something calming, relaxing, and centering would be highly beneficial? After all, having something that helps you while you are trying to do those tasks may end up making you a lot more productive! That’s where these 20 Stress Reliving Herbs and Teas come into play. Which Stress Relieving Herbs and Teas Will Work for Me? Every herb has different chemical properties that your body will respond to. You may respond very strongly to one herb, where you dislike and have no positive response from another. The truth is that each person has different needs. What works wonderfully for your friend may not work very well for you. Why? You may run hot, whereas your friend is always cold. You may tend toward having oily skin, whereas your friend tends to have dry skin. She may be able to eat 2 pounds of fried chicken without gaining an ounce, whereas you gain just by smelling it 😉 These are some simple examples to demonstrate that our glands, organs, response systems, metabolisms, etc. are at different levels of health and may respond differently in different situations. Combining all of these complex systems together shows that we are very very complex, designed human beings. If something doesn’t work for you, try something else. Because you are trying to limit stress, don’t force yourself to drink something that is a big deal to get down. Instead, try to combine it with something else (some fruit juice or another herb), or give it to a friend and try something different. That’s why I’ve given you such a great, long list. Find what works well for you. These all have properties that will help, it’s just that some will respond stronger to some or enjoy others better. So have fun exploring. Do it with a friend so you can trade around what you like and don’t like. Some herbs should not be taken while pregnant or nursing. Some can help the stress of pregnancy, but should only be taken past the first trimester. Some herbs should not be combined with prescription drugs. For example, if you drink an herbal tea that lowers blood pressure (whether you realize it does or not) and you are also taking blood pressure medication, your blood pressure could drop too low. Do your research. Talk to a naturopathic doctor! I’ve included links to help you find these herbs. I know sometimes it’s hard to find growers that you trust. 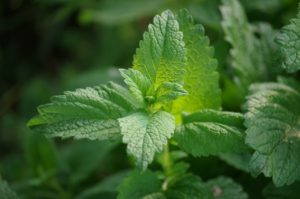 1) Lemon Balm (Melissa officinalis) – Lemonbalm is wonderful for calming the nervous system. In fact, it can be chewed and used on cold sores just as they are coming out to help calm the reaction from the nerve to the virus. It makes a wonderful lemony tea that is known to sooth heart palpitations and calm restlessness, not to mention that it is a strong anti-viral that is great for digestion as well. Find It Here. 2) Peppermint (Mentha x piperita) – Peppermint is an herb that you grows with a vengeance. It’s wise to plant it in a pot, and even then it may send roots out of the bottom and into your yard 🙂 I love the smell of it and I find it very relaxing. Find it Here. 3) Green Tea – Tea has tannins, which is an astringent. Green tea is also anti-inflammatory (which those under stress need). You could drink any tea that helps you to relax, but green tea is very high in antioxidants, helping your body heal from excess stress. Though you can use many varieties of green tea, I do recommend that you find a reputable source, buying organic if at all possible. Find it Here. 4) Blue Vervain (Verbena hastata) – I just recently learned about blue vervain. It has traditionally been used to cleanse your liver, relax muscles, reduce sugar cravings, balance hormones, and calm nerves. Common in North America, this plant is also used for sleeplessness. Not recommended for pregnant women, but is used for nursing mothers who have a difficult time producing enough milk. Find it Here. 5) Indian Ginseng or Ashwagandha (Withania somnifera) – Apparently, Ashwagandha means “smell of horse”, so this may be a tea you want to combine with another sweet smelling herb like hibiscus. It is popular because of its amazing ability to lower cortisol! Super important in staying cancer free. Find It Here. 6) Chamomile (Matricaria chamomilla) – Chamomile is a very mild herb that is known for it’s calming effects on the nervous system and digestive tract. It is in the ragweed family. If you know you are allergic to ragweed you may be able to use a small amount of chamomile in your tea to help inoculate you, but you should be careful so that you do not have a reaction. Find it Here. 7) Passionflower (Passiflora incarnata) – Passionflower is a mild herb that helps reduce anxiety, muscle tension, and insomnia. It has also been used to help reduce hot flashes. I have read that this should not be used by people on anti-depressant medication. Otherwise, it is considered mild enough for children or elderly. Find it Here. 8) Lavender (Lavandula angustifolia) – One thing I love about lavender is that it is mild enough to use with children (as are many of the other herbs mentioned here). Aromas have a strong effect on our mood and stress levels. 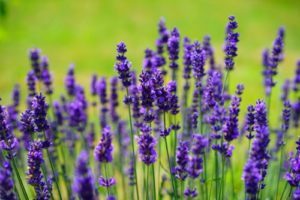 If lavender is a scent that you enjoy, then grow your own plant and regularly make your own tea with it. It is also mildly anti-viral, helping to give your body a boost when needed. Find it Here. 9) Barley Grass (Hordeum vulgare) – According to Mountain Rose Herbs, “A single tablespoon contains a day’s supply of beta-carotene, betaine, biotin, boron, copper, iron, lutein, magnesium, niacin, riboflavin, and thiamine. It also contains nutritionally significant amounts of alpha-linoleic acid, oryzanol, potassium, selenium, zinc, and the tocopherols that make up vitamin E.”1 Studies suggests barley grass significantly reduces stress responses. 2 I would avoid it if you have a grass allergy or are highly sensitive to gluten. Find it Here. 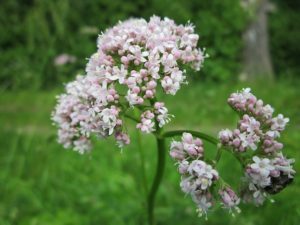 10) Valerian Root (Valeriana officinalis) – Valerian is commonly used as a sleep aid, because it is a very effective sedative. Great for manganese, magnesium, calcium, and vitamin C. I hear it stinks, but cats love it like they do catnip. Most commonly it is used in conjunction with other calming herbs in order to increase their effectiveness. Find it Here. 11) Slippery Elm (Ulmus rubra) – Slippery elm is high in vitamins B1, B2, B3, C, selenium, zinc, potassium, phosphorus, manganese, calcium, iron, and magnesium. This is the king of what you look for in terms of caring for a nervous system. It also creates a soothing coating in your digestive system, so any other herbs or drugs should be taken at least an hour before (or many after) to make sure you absorb them well. Find it Here. 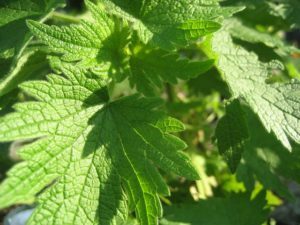 12) Motherwort (Leonurus cardiaca) – Not for those who are early in pregnancy, this herb is bitter and is often combined with another herb to enhance the flavor. It has a slightly mint flavor as well. It increases circulation, lowers blood pressure, and calms heart palpitations and nervousness. Find it Here. 13) Skullcap (Scutellaria laterifolia) – Modern use of skullcap is for alleviating nervous tension, exhaustion, and helping one to relax in order to sleep. It has also been used to ease the side effects of drug withdrawal, a big problem for the amount of people on prescription drugs these days. Find it Here. 14) Wood Betony (Stachys officinalis) – Wood Betony has traditionally been used in Europe for many ailments, such as an astringent on wounds, premenstrual cramps, or for headaches and migraines. It is often used as a sleep aid and to calm anxiety, and is known to lower blood pressure. Find it Here. 15) Holy Basil (Ocimum sanctum) – Many studies and clinical experience show that Holy Basil (tulsi) reduces anxiety, lowers cortisol levels, and moderates adrenal responses. 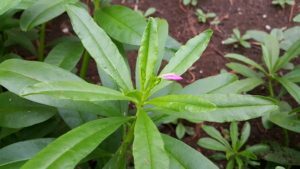 It is a anti-viral and anti-bacterial herb, and is used by some to help regulate diabetes. Find it Here. 16) Siberian Ginseng (Eleutherococcus senticosus) – This is one herb that may not help with sleep, but instead help to energize you. Instead of being a calming herb, it is more of a strengthening herb. Often used for heart conditions, it also effectively reduces the effects of stress (like exhaustion). This may not interact well with prescription drugs. Find it Here. 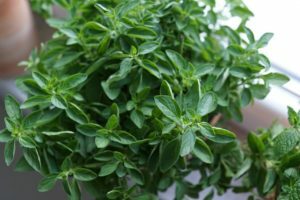 17) Thyme (Thymus vulgaris) – If you want a super antioxidant, here it is! It boosts circulation and is full of great vitamins and minerals. It lowers blood pressure and boosts your immune system by its Vitamin C content (vital for white blood cells to function properly). Its vitamin B combination supports your nervous system and will work as a calming agent. Find it Here. 18) Oregano (Origanum vulgare) – oregano is great for energizing the body, as a great antioxidant and anti-bacterial. It also contains vitamins K, E, C, manganese, magnesium, calcium, and iron. Did you know it also has omega 3 fatty acids? It works against stress by reducing the effects. This is something you would increase in your diet when you know you have been or will be under stress. Find it Here. 19) Rosemary (Rosemarinus officinalis) – Rosemary gets your internal systems moving. It increases blood flow to the brain (increasing memory and focus) and lowers cortisol levels (very important when under stress). Find it Here. 20) Sage (Salvia officinalis) – Sage is an astringent (great in homemade deodorant). It also works as an internal anti-inflammatory. Like rosemary and oregano, it helps regulate blood sugar as well. It’s strengthening power helps to alleviate the damages of stress. Find it Here. All of these can be made into a tea by steeping 1-3 tsp per 8oz of liquid. Thank you for posting such a useful article, Kelly. This is so great. How often do we drink coffee and tea for a caffeine “buzz.” This is clearly a superior alternative. Thanks for sharing. Great post! I love using natural remedies and this is a very helpful list. Thank you for sharing!! Wow! This is so helpful! 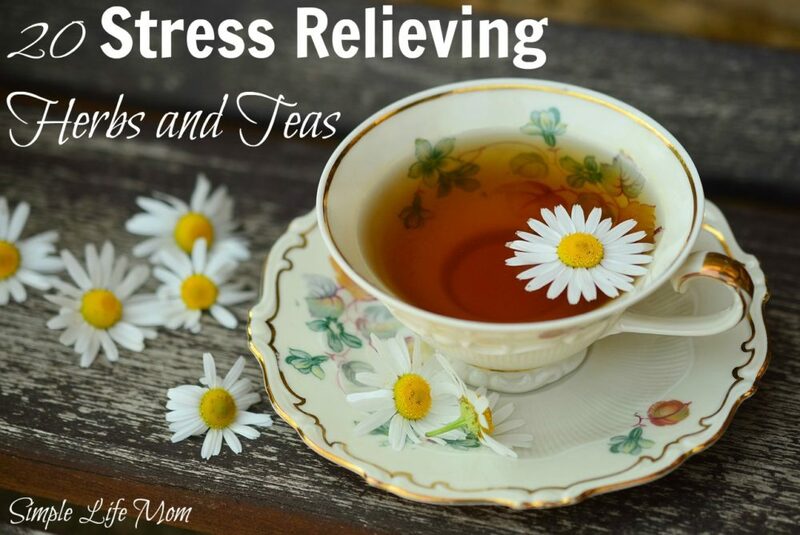 I love the idea of using teas to relieve stress, and unfortunately, I’ve got plenty of stress lately! This is wonderful to know. I have lots of lemon balm growing in the yard and now I have some more things I can use it for. I love lemon balm. I had no idea when I started growing it that it would be so prolific. Makes you wonder any the essential oil is so expensive…. I so much love the idea of a stress reliever! This is a great article Kelly. I find that Valerian root, Indian Ginseng, and Chamomile work very well for me. I will need to try these others. I’ve previously stayed away from chamomile because of my crazy grass allergy, but I’m finding that boosting my health has improved my allergies greatly! I may have to carefully try some. I love Chamomile tea! So soothing! Bookmarked and Pinned! Much needed information for me… LOL! Thanks! I love trying different teas! Very nice post! Thank you for sharing on the homesteader hop! This is a fantastic list! I often use passionflower because it works so well for me. Thanks for sharing! As a longtime caregiver for a sick parent who I love dearly–among other responsibilities –stress is my middle name so thank you for sharing 20 Stress Relieving Herbs and Teas with us at the Plant-Based Potluck Party. I’m pinning and sharing. Thanks for sharing on Let’s Get Real. Love teas. Was just in Minneapolis and the Mall of America a couple of days ago. They have a David’s Tea store. Purchased Mint Matcha. I drink matcha tea every day, plus a cup or two of others, but I hadn’t tried a flavored matcha before. Can’t wait to try it today. I’ve heard of a lot of these, but haven’t tried many. We have some sage and rosemary growing that we hardly ever use. Maybe I’ll try one of them out tonight in a tea! Gotta love those herb gardens! I have herbs tucked in all around my home and we love going out and gathering for various uses. Hey Kelly gave up tea and coffee a long time ago and this post shares wonderful healthy alternatives. Love mint tea. I dry fresh peppermint and they a twig or two make wonderful tea that is uplifting and healthy. Very informative!! So glad I came across it!! Pinning!! Thank you! !